Soon after we constructed our deck three years ago, we applied Behr Deck Stain (premium, natural color, w/ 4-year-guarantee). The Behr product promised superior, long-lasting protection on southern yellow pine decks (of which ours was constructed), and other types of wood decking including maple and redwood. Immediately after we applied Behr’s product, we were dissatisfied with the color, which looked very orange compared to the picture on the can. 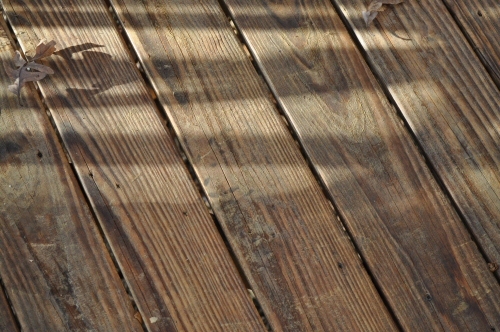 We ran a follow-up review of Behr Deck Stain two years later showing how it also failed to protect from water penetration starting just 7 months after the application. In October and November, we removed the Behr Deck Stain from our deck altogether using a complicated and time consuming process involving two chemicals made by American Building Restoration (ABR) Products , Strip-It-All and Fast Finish Remover. After getting the deck completely cleaned off, we decided to try a new product based on the recommendation of a local deck sealant vendor, Virginia Chemical and Equipment. 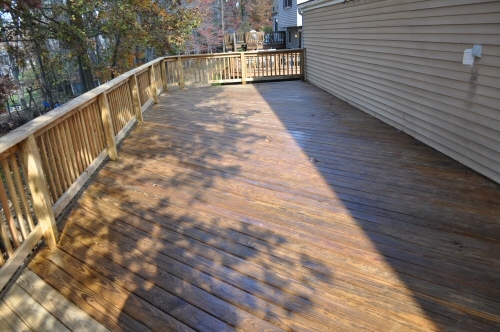 VA Chemical recommended X-100 deck sealer (spec sheet). X-100 is a long chain oil-based sealer designed to penetrate deep into the wood’s surface, sealing up cracks and splits. The salesman at VA Chemical suggested going with a tinted variety of X-100 for added UV protection, but we knew we wanted a sealer that was as transparent as possible to achieve a “wet wood” look. So we chose X-100’s transparent wood preservative sealer. What follows in our initial review of the product just two months after installation. As time passes, we’ll update this post with links to follow-up reviews so you can get an idea of how this product performs over time. The highs: Beautiful, transparent “wet wood” look, easy application (including easy to get it evenly spread), simple clean-up with mineral spirits, decent coverage, reasonable price, future coats can be applied on top of existing coat without stripping. The lows: Long dry time, lingering oily smell. The verdict: A beautiful deck sealer that brings out natural tones, but be prepared for two weeks of that lingering oil smell. Method & Coverage: We applied X-100 to 1000 square feet of Southern Yellow pine that had been stripped just weeks before. We applied the product in late October/early November, which in Maryland means a relatively cold and dry application (about 55 degrees, low humidity). The wood eagerly absorbed the sealer. Coverage ended up being about 180 square feet / gallon on the surface. We used a medium-nap roller and back brushed to ensure the sides/edges of the wood surface were covered. Number of Coats: After one coat we could tell that the surface of the wood felt just a bit oily, and decided that a second coat was likely to sit on top of the wood rather than seep in uniformly, significantly delaying dry time. So we went with a single coat this year, planning to potentially re-coat the deck in the late Spring or early Summer next year after a light power washing. Drying Time: The surface of the wood “dried” to the touch in about 2 hours. However, for two weeks thereafter, a remnant of oil seemed to stay on the surface and could be tracked into the house by shoes. This would have been more problematic had this been prime deck-using season. Fortunately, we had already packed up the deck for the year. For the two weeks where this was a problem, we had almost no rain. I suspect that a solid thunderstorm may have rectified the oil problem. Sealing: After two months with the product, the deck seems to be beading water just as expected – no complaints on performance. The salesman at VA chemical said that X-100 is an “every other year” product after the first and second coats are applied. Accordingly, he recommended coming back over the first coat next Summer with a brightener and then another sealing coat, and then waiting two years between coats after that. We’re looking forward to testing that claim. Color & Look: X-100 is exactly what we were looking for in terms of look. It darkened up our southern yellow pine to a rich tan color that highlights the grain in the wood. It complements our house well, which is set in a wooded “old-growth” forest. This picture shows the detail in the grain, which is marred a bit because the power-washing to remove the Behr stain was a bit too forceful and created fibers on the surface. We didn’t have time to sand down the whole deck, so these imperfections remain. (Note that this isn’t at all the fault of X-100, and in terms of notice-ability, this has gone down quite a bit in the last few weeks as the weather wears the surface). Price & Where to Buy? We paid $120 / 5-gallon drum, or about $24/gallon from VA Chemical. You can find this product locally using ABR’s dealer locator. What do you think? Have you had a good or bad experience with X-100 or another transparent stain/sealer? Please let us know in the comments. Sounds like you had an interesting experience. I weatherproofed my deck this fall with a transparent stain that went on pretty well and didn’t seem oily – I think it was just Thompson Water Sealer… have you heard anything pro/against that brand? It really looks great! I am interested to see how it looks with another coat. Sara, I am looking forward to following up this article. We were so disappointed with Behr, we’re looking for a good solution. This looks promising so far, and the fact that it can be recoated without stripping again is a HUGE plus. Seems like a good product. The winters are long and very wet in Vancouver and this product may be a better alternative than Behr. We actually used Thompson’s on a fence a while back. Thompson’s definitely works OK, but has a shorter lifespan than the long chain products (it’s an every-year sealer, from what I know of it). I suspect the lingering oily smell and penetrating qualities of X-100 might be linked, but we will definitely see. Thompson’s Water Sealer is basically a parafin (wax) based product. That is what provides the water repellency, at least temporarily. I would recommend the Flood SWF (solid) or the TWF (semi-transparent) stains- these are hybrid (oil/acrylic) products. This provides a combination of good qualities: the penetration of the oil, and the color retention of the acrylic. The Flood products are guaranteed 3 years on decks, and 5 years on siding. Sikkens and TWP are also excellent alternatives. 4 years have gone by! Have you scrapped the deck? Any word to share on your experience with X-100, four years after application? 7 years have passed. Can you provide a follow-up/long term review? I used this 2 yrs ago on a cedar railing and looks exactly like it did then. Still beads water off. Did some touch up on some cracks and soaked in and matched color. Used a light tinted clear.